This is the kind of jam I would eat for breakfast in the mountains, in an old wooden hut, the morning table strewn with rustic delicacies, thick slices of a hearty loaf of bread, Tyrolean prosciutto, strong cheese, rich butter and this dark jam. It’s very fruity and concentrated. 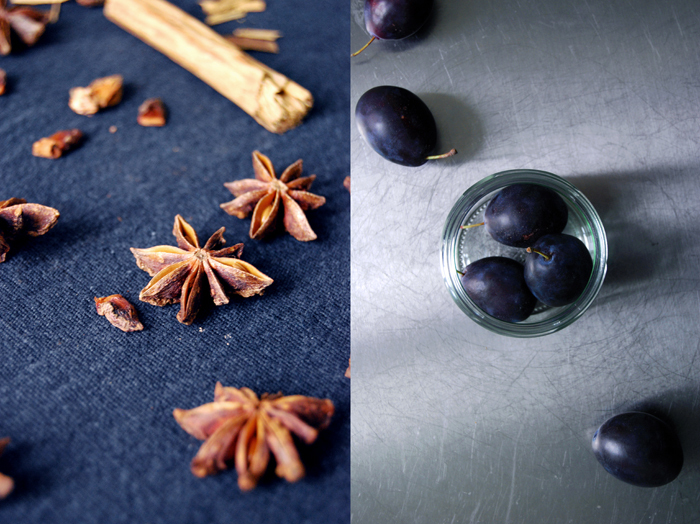 The purple fruits cook for around 20 minutes with cinnamon and star anise which gives this thick spread a warm autumn touch (I don’t really like to call it wintery yet, it’s still too early in the year). The little pieces of the fruits’ skin curl up and turn into caramelised fruit bites, delicious! 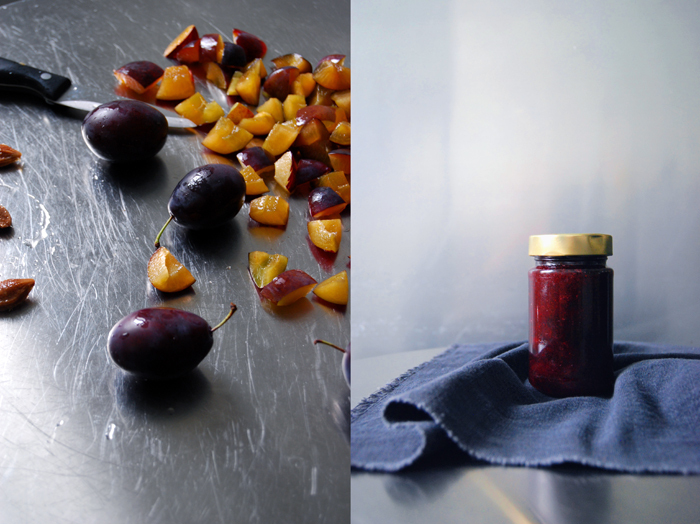 For my jams, spreads and chutneys, I always try to find the ripest fruits possible, it makes such a difference in taste! 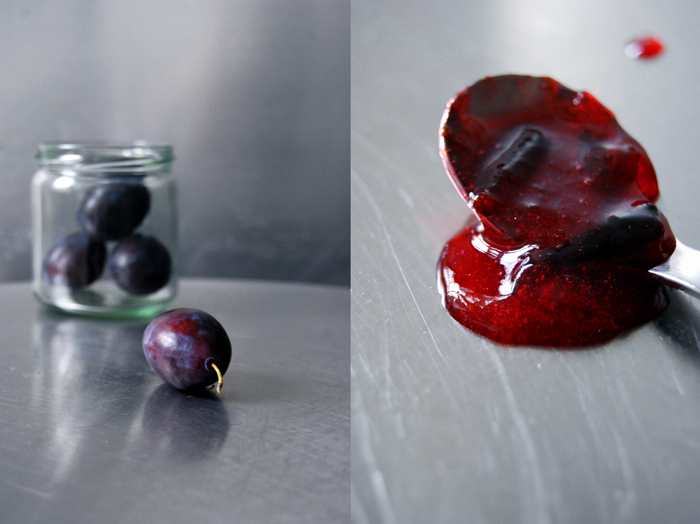 Especially when it comes to plums which develop the best side of their strong aromas when they start to soften. Natural sweetness, that’s all you need! 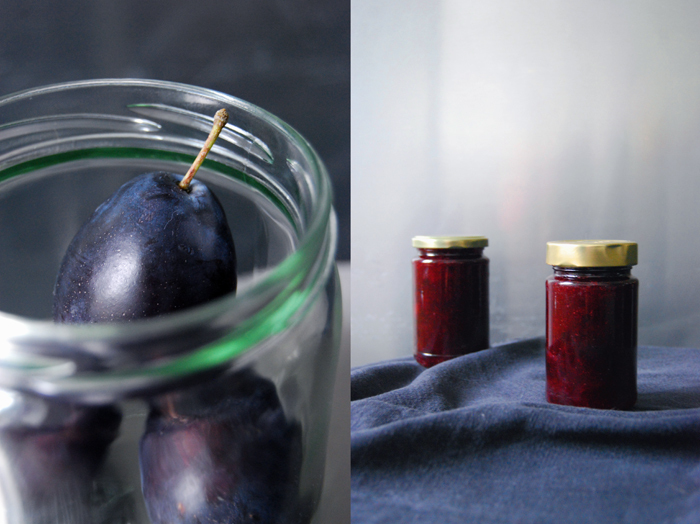 A hard and sour fruit won’t develop its whole range of flavours in a jam. I call this spread my Tyrolean Plum Jam as my mountain memories lie in Corvara in the Alta Badia region in South Tyrol. We used to spend many winter holidays in the Italian Dolomite Alps when I was a child, a time of hearty mountain food, aromatic cakes and strudels and some of the best breakfast tables I’ve ever had! When you cook jam you should always use a tall pot to prevent the jam from boiling over. The fruits will be two to three times as high when they’ve reached boiling point! My pot is 24cm / 9.5″ high and 20cm / 8″ wide. Sterilize the jars and lids in boiling water for 5 minutes. Dip the rims of the jars in spirit and wash out the lids, wash the ladle (you will use to fill the jars) with the alcohol as well. If you can get a thick foil for jam jars (thicker than cling film), cut out 3-4 circles roughly the size of the jars and put into the spirit as well. Put the fruits, sugar and spices in a pot and bring to the boil, stirring with a long wooden spoon every now and then. When the boiling point is reached (you should see quite a few bubbles coming up), let the jam boil for 20 minutes, carefully stirring a couple times (without burning your hand, hence the long spoon!). Take the pot off the heat and fill the prepared jars with the sterilized ladle almost to the top. Cover with the circles of foil and close tightly immediately. Let the jam sit for a day (or even a month) before you put it on your breakfast table and store the jars in your pantry. 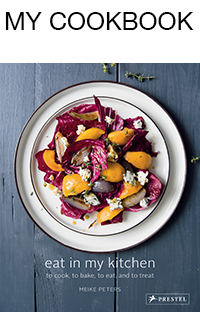 Thank you for this recipe, just the inspiration I was looking for. Meike, so beautiful! And I love the unique shape of those plums!